Since scientists have finally figured out that tinnitus is mainly in the brain, not the ears, research has taken a few leaps forward, and already they’re working on effective treatments and even some possible cures for the condition. In a recent study, Kilgard induced tinnitus in rats by exposing them to loud sounds. Then he used tiny electrodes to stimulate the rats’ vagus nerve, a pathway connecting the brain to other organs. Each jolt of micro-current triggered the release of a substance called acetylcholine, which signals the brain to pay attention. In sync with the stimulation, he played a wide range of tones — all except the one matching the frequency of their tinnitus — and repeated this 300 times a day for three weeks. The tinnitus disappeared in these rats, while a control group still had the condition. In effect, Kilgard says, the rats’ brains were retuned, unlearning the tendency to overfocus on one tone by increasing the number of brain cells dedicated to other sound frequencies. Kilgard’s study, published earlier this year in Nature, set the stage for a human trial by Dirk De Ridder, M.D., a neurosurgeon who heads a tinnitus clinic in Antwerp, Belgium. 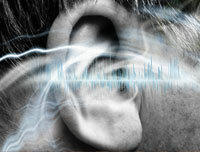 De Ridder is implanting electrodes in 10 middle-aged tinnitus patients, each of whom has already tried various experimental techniques, including medication. He says he works with one patient at a time, as each undergoes vagus nerve stimulation coupled with sound therapy for 2 1/2 hours a day for four weeks. This is very much a pilot study, where the researchers hope to figure out some basic parameters (how long to continue treatment, among other things) that will guide a larger study. The eventual cure might require some tiny electrodes to be implanted in the neck, but take it from someone who’s been suffering from the condition – which steadily gets worse – since 2003, that would be a small price to pay. Well, except for the monetary price, of course, since no doubt insurance companies most likely will not decide to cover them.